This walloping wagon might seem out of step with the SUV Appreciation Society but who cares about that? SURPRISE automotive news of 2018: Not every new passenger model coming out this year is going to be a sports utility. I’d understand if this comes as a bombshell. SUVs are very much the ‘it’ products of the moment, right? They dominant new car registrations and, generally, are the sales leaders for all mainstream brands. Even the one sector that cannot physically adjust to the SUV shape, one-tonne utes, is touched by this trend, in that traydecks are often bought as SUV equivalents. Audi New Zealand is far from immune from the SUV shift. It’s Q2, Q5 and Q7 achieve 56 percent of its annual volume, and that penetration will surely increase with the Q8 and Q6 arriving next year. 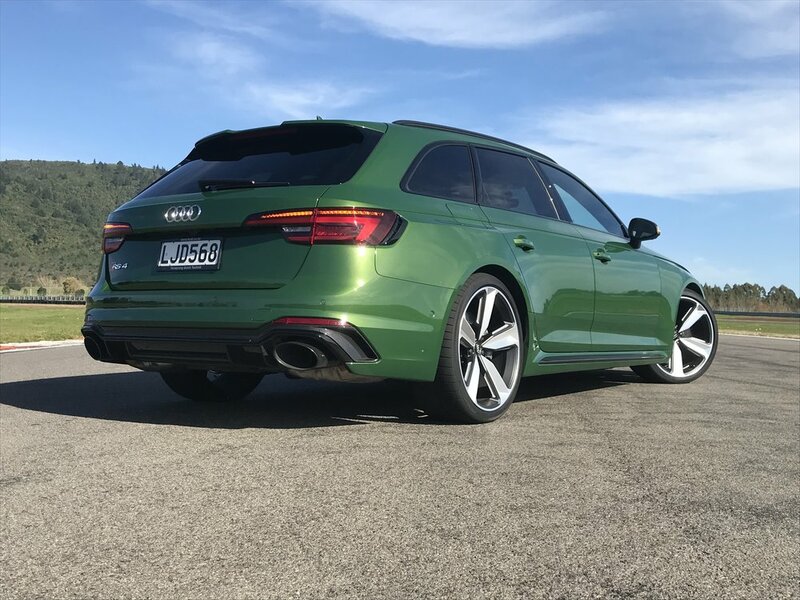 The impact of their rise has affected trad station wagons yet, ironically enough, while the standard A4 load-all is all but goneburger, its most extreme evolution is set to continue to go gangbusters. 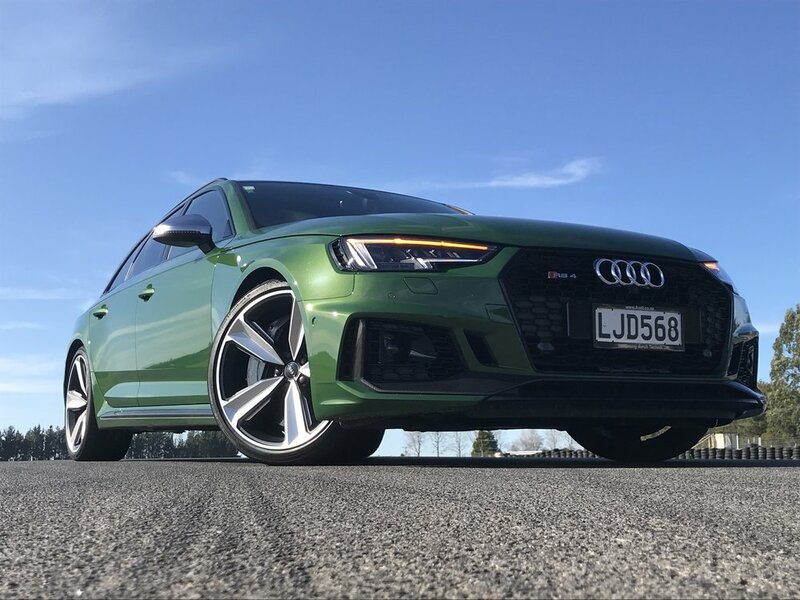 Evidence supporting Audi NZ boss Dean Sheed’s belief that the RS4 Avant will not only flourish in its current fourth generation but will likely spawn a fifth evocation, presumably in 2024 (since past editions have had six-year cycles) quickly accrued during our first drive experience. There’s no doubt there are SUVs that have something of the same panache, practicality, price and even performance punch as this $149,900 model. But surely none blend all those factors as well as the RS4. It comes down to this car having an all-round pedigree. From my experience, at least, nothing elevated is quite as superb on the road let alone as stunning on a circuit. Who wants something so honed? Audi NZ can answer that in numerical terms. 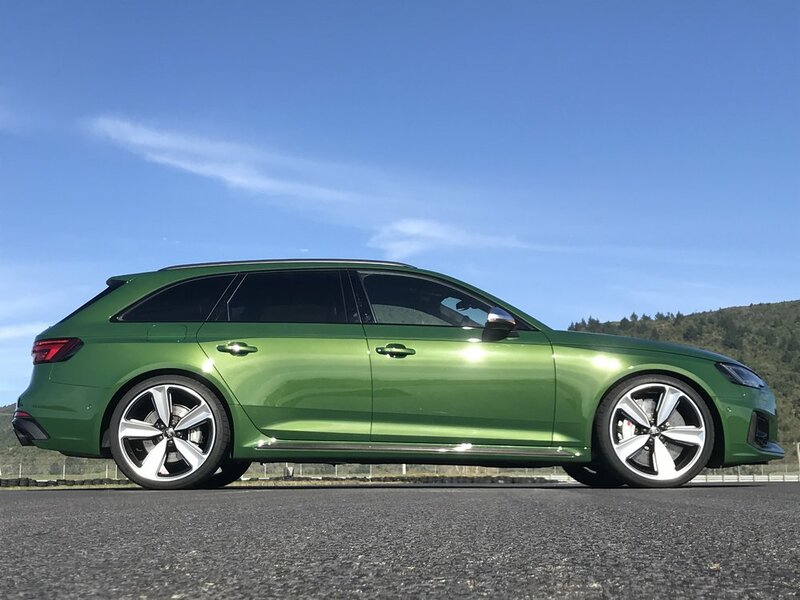 It expects to place 100 examples of the gen four RS4 Avant into Kiwi homes over the next year, a count that’ll safeguard this car’s historic status as the country’s most favoured RS product. There’s powerful inducement to buy into the new B9: It has equal 331kW power to the old model, but it’s 600Nm is a third again more torque, the body is lighter and there’s more tech. It’s demonstrably a better drive. And at $149,900, it’s cheaper in starter form. What’s not to like? For some perhaps, it’ll be saying goodbye to an engine that’s become an icon. Transition away from a 4.2-litre V8 that served well in this model for two generations to a V6 is a full-circle move – the first of this kind had one of those, too, albeit not with the twin turbo set-up now availed. A known quantity, having first shown up in the $3000-dearer RS5 Coupe that landed last November, the latest engine is a ripper – heaps of punch yet more manageable, due to a massive flat torque spread that straight lines from 1500rpm through to just under 4000rpm. It’s the kind of powerplant that, you feel, could counter the Earth’s rotation. Still, chance to drive the B9 against the B8 at Taupo’s Bruce McLaren Motorsport showed the outgoing edition, though now six years old, feels younger and fresher than its years. The new six has a beautifully modulated timbre, yet it’s a tenor singing a tune that we’ve become used to hearing knocked out in a deeper note. There’s still a special something about hearing the rolling thunder of that V8 sound resonate lazily around the circuit; that’s for sure. And something a little bit different to learn that the new engine, though co-developed by Porsche, still requires its soundtrack to be artificially enhanced in Dynamic mode. Also, while the dynamic advancement is obvious, the old gun can still call some shots: Yes, the steering is heavier, the chassis isn’t as balanced, but you cannot help but admire a four-paw car that has willingness to throw its tail out, just so, on a fast entry: That’s one talent the B9 seems to have lost. For sure, the new model is faster through the bends – down the straights, too – but what’s wrong with a bit of fun to remind the scale of the forces involved? Either way, on track, they’re both massive weapons that attack with ferocity and flair. Like I say, the six is measurably faster – the factory-cited ability to clock 0-100km in 4.1 seconds against 4.7 wasn’t specifically tested, but we did drag races in which the B9 wiped the floor on all but one run. (Hey, I had a lucky start against a usually quick rival). 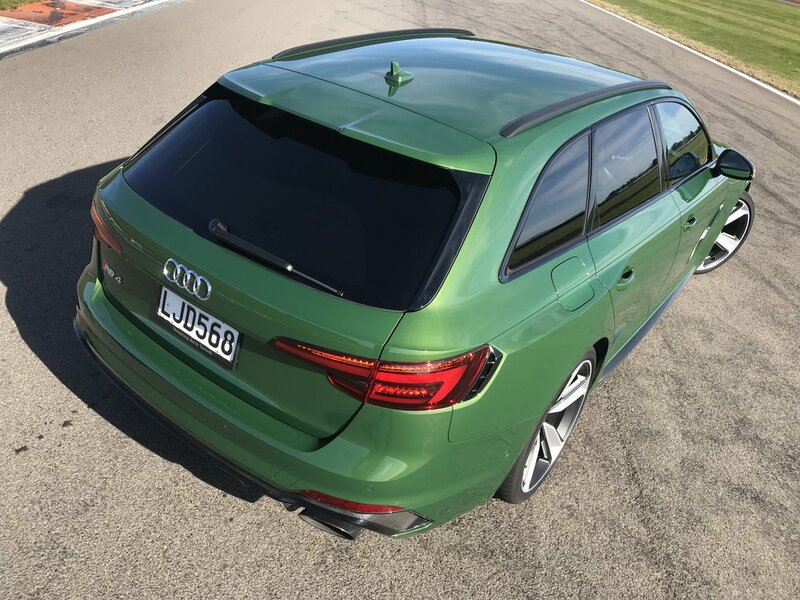 Another V6 advantage is that it gets Audi back in the Green in respect to economy and emissions. Admittedly, you’d need to drive with more circumspection than I managed in order to hit the claimed 8.8 litres per 100km optimal economy, but for a car of this calibre to even run in a sub-10L/100km territory is decent, right? Quattro and 275/30 R20 rubber combine to give the RS4 impressively adhesive qualities on the road as well as the track. What also helps it dance more precisely is weight loss; an impressive 80kg. Okay, it is still a 1715kg car, yet it does have a more ‘natural’ feel now, thanks to almost half the kilo cull occurring over the front wheels, thus largely diluting the old car’s nose-heaviness. Funnily, in losing the fat it’s gone extra-phat, with a road stance that’s even more imposing that the old car. At 2022mm wide, this RS4 Avant is broader than an RS6! You needn’t head onto a track to experience that it’s a bit special. At the same token, the hard-out settings that best suit the circuit aren’t wholly the best for the road. While the transmission, engine and steering can be left in Dynamic setting in the public arena (tailoring via Individual), unless you happen to strike a blemish-free autobahn, it’s honestly best dial the suspension down to Comfort, or at least to Auto. Assuredly, there’s still no slop, but when Audi set this car up they clearly didn’t have any consideration for our coarse chip. This car doesn’t so much fidget on our harshest surface when on its least yielding suspension setting so much as jackhammer. Nein, danke. The new auto is brilliant; in the past you’d have doubts about whether torque converter could suit the nature of a car a like this, but it really does. You get smoothness and swift shifting, but none of the old box’s occasional bang-crash. When the car is being hammered, the box works with such alacrity that many drivers might mistake it for the dual-clutch gearbox it left behind. The steering is lighter and seems more accurate, too, and that trademark flat-bottomed wheel is fantastic to grip. 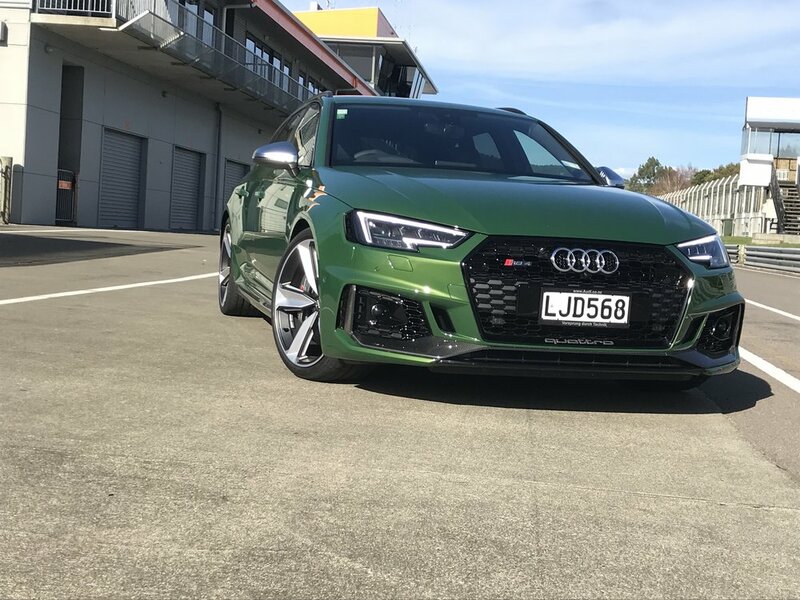 Anyone out to enjoy the RS4 on a track regularly might like to invest an additional $3500 for the ‘sport differential’, an electronically controlled rear differential that can apportion as much power as it likes to either side, as standard. A ceramic brake upgrade probably also helps yet is hardly imperative. Unless you live at, and regularly pound around, a circuit save yourself $15k. It’s not exactly coming here is stripped-spec, anyway; quite a few features that are usually optional elsewhere are standard here. Dynamic steering, which adjusts the steering ratio depending on speed, RS exhaust tuning for the quad pipes, sports seats and 20-inch rims are examples of this. Also added are Matrix LED headlights that deliver an impressive beam and self-adjust to avoid blinding oncoming drivers, electrically heated, adjustable and folding door mirrors, and a powered tailgate. 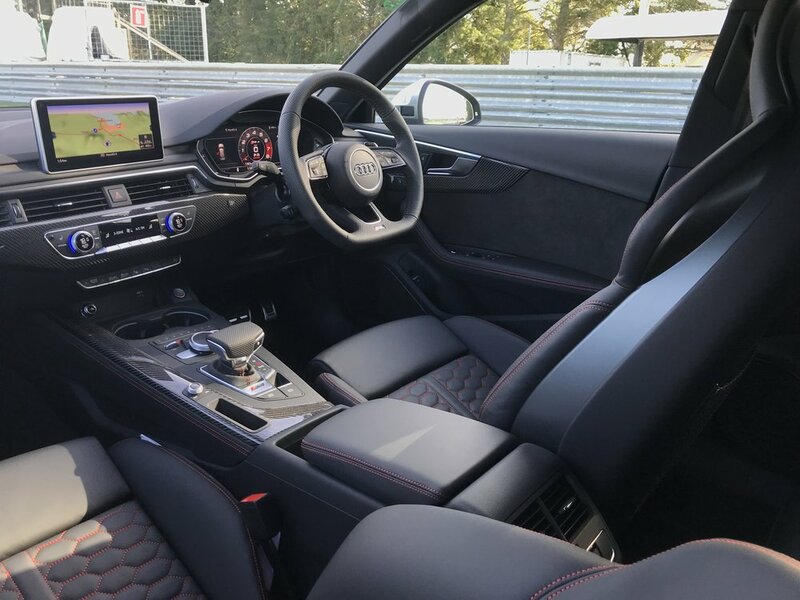 It’s a full-blown luxury model, too, impeccably finished and also carrying comforts such as so tri-zone climate control, ambient LED interior lighting, stainless steel pedals, heated and massaging front seats and a Nappa leather upholstery. Completing the package is the MMI infotainment system with 8.3in display and Audi’s 12.3in Virtual Cockpit. As always, there’s chance to embellish with carbon fibre and alloy. Above all, it’s pretty family friendly. Four large adults will fit with ease and there's no shortage of head or leg room in the front or back. There a 505-litre boot, while the rear seats can be individually folded to make the most of the maximum 1510 litres of storage. So, there you go. In a world so averse to station wagons, and so besotted by SUVs, this car could have become a faded memory. Be glad it remains very much alive.